12" x 24" x 36" Solid Top Dunnage Rack™ 750# Capacity | U.S. Plastic Corp. 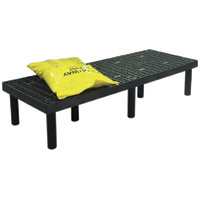 These heavy duty plastic grid or solid-top racks are easy to steam clean and disinfect. Resistant to oils, acids, and most chemicals. The flow-through grid allows liquids and scraps to fall or drain below. Lightweight for easy transport and cleaning of floor underneath. Choose the solid top design to use in areas where grip top is undesirable and a higher weight capacity is needed. 12" leg posts make it easy to clean floor underneath.